The Haldane Winter Party 2017 will be on 15 December 2017, at Garden Court Chambers. Advance tickets are £10 (full price) or £8 (student/unwaged/low waged). Tickets on the door will be £15/£10; we will accept cash or PayPal. AGM and Lecture: What does it mean to be a socialist lawyer? Members of the public and of the Society are invited to attend the first installment of our annual lecture series, on 16 November 2017 at 6.30pm. 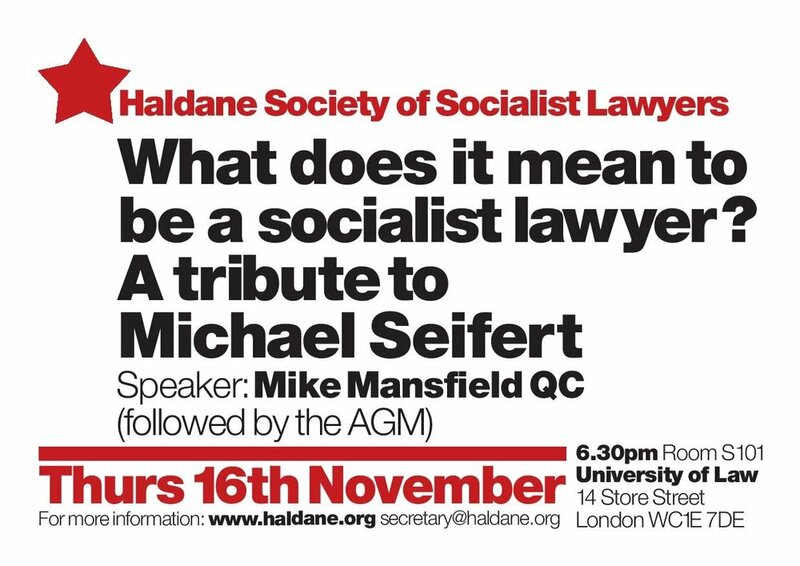 Our lecture will be on "What does it mean to be a Socialist Lawyer? A tribute to Michael Seifert." The main speaker will be Michael Mansfield QC, and there will be time for questions and contributions from the floor. The lecture will be followed by our Annual General Meeting. The Annual General Meeting passes the policy of the Society, receives reports, and elects the Officers and Executive Committee. Nominations for election, along with a manifesto of up to 100 words (statements longer than 100 words will be truncated) may be received any time up to 72 hours before the meeting (i.e. by 6:30 pm on Monday 13 November 2017). Nominations may also be taken from the floor at the meeting, but these obviously will not be supported by a manifesto. Motions may be proposed any time up to 72 hours before the meeting (i.e. by 6:30 pm on Monday 13 November 2017). Emergency motions may be submitted from the floor at the meeting.